Of course, the hysteria surrounding Luck involves one more unique scenario, when considering that the two-time Pac-12 Offensive Player of the Year will almost certainly be replacing Colts legend Peyton Manning, once Indianapolis selects Luck, after finishing with the NFL's worst record. During his three seasons in Palo Alto, Luck threw for 9,430 yards and 82 touchdown passes. When factoring in his status as a three-time Pac-12 all-academic selection, Luck is thought to be the closest thing to a perfect draft prospect. Prior to this week's NFL Scouting Combine, which takes place in of all places Indianapolis, many draft prospects are working out at Athletes' Performance, located at the Home Depot Center, in the Los Angeles County city of Carson. Home Depot Center also serves as the home of the LA Galaxy and Chivas USA of MLS, as well as the practice venue for teams prior to taking the field for the Rose Bowl. Wednesday, Luck and Oregon star running back LaMichael James were exiting the practice field, when I asked if they would pose for a photo with me. Both future NFLers could not have been nicer, as each Pac-12 legend took a moment to pose for a photo, while the other pushed the button on my camera. Both men indicated that they were heading to Indy on Thursday. 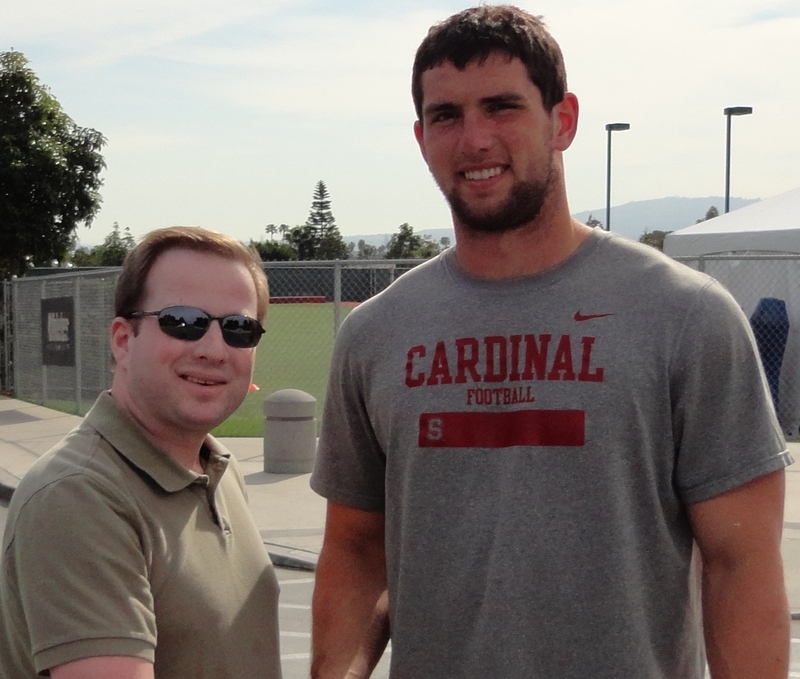 The biggest takeaway from standing next to Luck, per the above iFollowSports.com original photo, is how big and well built the guy is. Besides his big arm and obvious intellectual capacity, Luck will definitely impress scouts, coaches and general managers with his sheer size and imposing stature. It must be nice to be Andrew Luck these days!